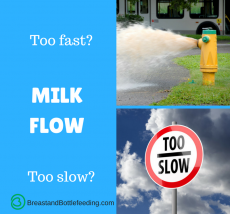 Milk Flow: Too Fast or Too Slow? Baby milk can flow too fast or too slow from the breast or bottle. You can tell by watching how your baby acts or “behaves” while feeding. We call this reading baby behaviors. Your baby may have one or more of these various behaviors to indicate the flow isn’t just right.